Russian Navy’s Udaloy-class destroyer Marshal Shaposhnikov (BPK 543) has docked at Iranian port of Bandar Abbas. The visit by the anti-submarine ship (nicknamed “submarine chaser”) is the first by a Soviet/Russian Navy ship to an Iranian port in more than 40 years. “Marshal Shaposhnikov, a Russian Udaloy-class destroyer, has docked at this port with the aim of strengthening military ties between Iran and Russia,” Vice-Admiral Hossein Azad, commander of Iran’s First Fleet, said on Wednesday. 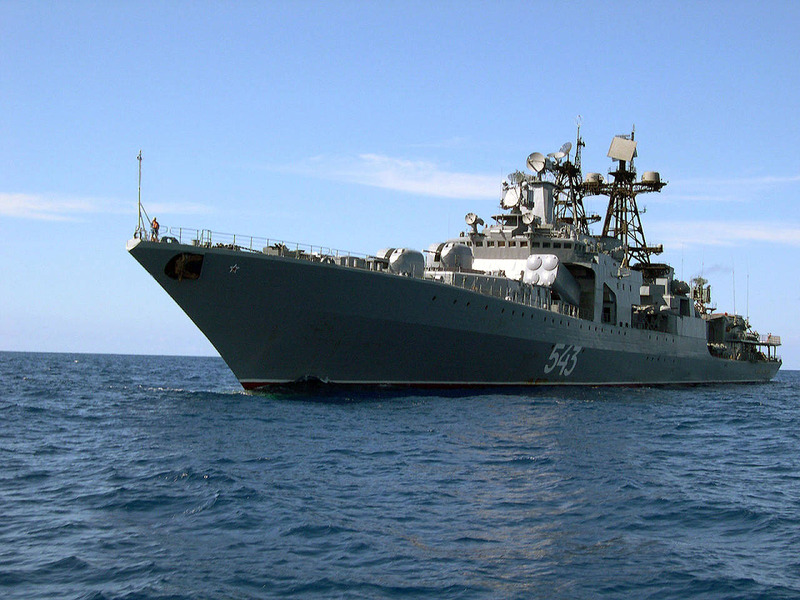 File photo: Russian Navy Destroyer Shaposhnikov (BPK 543). A very welcomed visit by our honored neighbours. Russia & Iran forever! A very warm welcome indeed. Russia, Iran and China are natural allies and must cooperate more to secure the region from predators. I believe that Russians now understand Iranian position far better and the future will only strengthen this cooperation. BTW, a large Russian taskforce with assault capability (marines) has also docked at Tartus to bolster the Syrian goverenment which in on the offensive against NATO/US funded Salafi terrorists. Russia has also supplied Syria with 24 hypersonic Iskander (SS22) missiles ( that can even knock out a aircraft carrier. The Iskander’s hypersonic speed of more than 1.3 miles per second with a 280 mile-range and a 1,500-pound warhead which destroys targets with pinpoint accuracy. It is also NBC-capable. Yesterday, the Syrian PM visited recaptured Aleppo and by all objective analysis, the Syrian troops appeared in very high morale, had first-rate body armour, brand new upgraded T-72Z tanks (ERA plates for anti-missile defence) and new COIN equipment and displayed execellent unit cohesion. Syrian military has once again proved to be the best in the Arab world. The ships off Tartus Syria are the Russian fleet’s two largest amphibious assault vessels, the Kaliningrad and the Alexander Shabalin, which is a cruiser converted to a guided missile frigate renamed Yaroslav the Wise, the SB-921 rescue and tug ship, and the Lena military tanker. This is Russia's largest offensive naval deployment and is a clear signal of its unstinting resolve to support the legitimate Syrian government which is now on the march to wipe-out NATO backed terrorists, including Taliban mercenaries from Afghanistan. This naval visit to Iran is just the beginning of greater cooperation. Great! Stalin hoped and worked to unite Russia and Iran forever!!!!! With client regime of al-Assad being systematically dismantled, Mr Putin to reinforce assets in Lower Caucuses and double down on Tehran... the post Assad prize... the fall of al-Assad, a blessing in disguise for Tehran. Iran is enhanced by these developments. Russia is feeling the heat in Syria, if Assad falls Iran will be the only country in the pro-Russian bloc. The Russians might as well actually deliver S-300's to Iran. You haven't a clue.Russia stole so much land belonging to Iran that to this day we are still paying for it. They are a dishonorable unreliable and two faced bunch of money grabbers which in many respects are very similar to the mullahs. But at least the Russian government is patriotic unlike the mullah regime which are anti Iranian and lovers of Islamist savagery. LOL!! How dare the USA ask Russia to remove their occupying army from Azarbaijan. Either you're joking or lack a brain in your cranium. every body in the world needs ally and freinds. alone you can not standa against nato. Iran and Russia ain't allies and have no real interests in common. Russia's use for Assad was as a customer for their weapons industry....and there hasn't been any "pro-Russia bloc" in the Middle east since the end of the Soviet Union. Russia ain't EVER gonna deliver the S300s, friend. So what are worth all the previous predictions and assumptions of the AUTHORS of THIS blog ??????? I am advising you to learn from the last Mr. Putin's statements, where he states that Russia needs to counter the attempts of those countries that are spreading chaos and knocking out the last remaining pillars of the old systems (of stability). It would be also beneficial to subscribe to the commentaries in "Russia Beyond the Headlines" and to commentaries by Mr. Fyodor Lukyanov, instead of to speculations in the Zionist medias..
P.S. I noticed that several previously posted articles, including those about American Thanksgiving, General Firouzabadi and Mass Murder in the US as well as others have been removed from this blog???? Is this another form of censorship and Mark's innovations ??? HERE COMES OUR STUDENTS !!! FACT-IT IS IRAN THAT TAUGHT RUSSIA VERY RECENTLY THE DRONE TECHNOLOGY!contrary to common perceptions about RUSSIA'S technological prowess,THIS NATION WAS HUMMILIATED BY GOERGIA DURING THEIR SKIRMISH THE OTHER DAY!,and Goergia had used ISRAELI DONES in that conflict an act that supprised the RUSIANS.THIS IS WHAT ISRAEL USED AS LEVERAGE TO BURGAIN FOR THE S\300 against IRAN.RUSSIA IS VERY THANKFUL TO IRAN FOR INTRODUCING THEM TO THE UAV WORLD!!. Hi, its me Mr Valdy Putin again......you know the world is awash in oil....but we must keep prices high.....mother Russia has nothing without high oil prices......My great friends in Iran....things must remain as they are for much, much longer.....remember I am your best friend.....smile...wink...wink!!! I know my history "kid". But you know zilch about the occupying forces of Stalin in Northern Iran.My family suffered from that occupation in Azarbaijan. A true Iranian would never welcome an enemy like the Russians into our country unless they are traitors or foreign agents. Are you one of them "kid"? B.M.A,when you are with your family do you shout a lot? Please go and get your ears seen too by a specialist. and, of course, iran is rather unlikely to forget that they paid the Russian for the S300 that they didn't get. I'm very sorry, friend..... but did you take my ironic comment about Stalin seriously???? you didn't realize that it was a reminder that Stalin repeatedly tried to take Iran by force and was directed at the knucklehead who called the Russians "honored guests"? My sincere apologies my friend! I often make ironic comments myself and should have known better. let's just be happy that we cleared up the misunderstanding. why do you assume that BMA has family that associates with BMA? why would you assume bad things about the family? As of yesterday Russia suspended any preparation for the 3rd and 4th large amphibious assault ships in her shipyards until 2016. At present France has been building first two, of the same class' ships (Mistral version) at the French shipyards. That delay may signal that Russia may anticipate that because Russia further and expanded support for Syria or Iran, it may cause a cancellation of the contract by France. Russia may need a naval base to patrol the Red Sea and the Gulf of Aden and it will save them money to base their ships in the vicinity instead to send them from the Baltic and Severomorsk to the Red Sea. Russia instead penalties, for the cancallation of the S-300, will have to provide modern technologies as an offset..
Higher oil prices have benefited so far Russia and Iran too. Russia is in a transition period to upgrade their military and they need extra time (before 2020) to advance that goal, before any arms race will commence. Iran too, needs extra time to domestically upgrade its immunity. Iran's population with its leadership's correct decisions is patient and able to waitover couple years of sanctions as it was shown during the imposed war with Iraq. Sometimes nations have to resist and it is a right price for the future peace and prosperity.